The exterior of the sleeve is a lovely taupe-coloured linen. It has basic envelope-style function with a very clever fastening method - small elastic loops emerge from under the flap, wrapping around the side of the sleeve and hooking on two wooden buttons on the back. Simple and elegant. The flap on the front of the sleeve is trimmed in one of four fabrics - options for both men and women. The interior of the sleeve is a cream-coloured lightly-quilted cotton fabric. Read the full review of the linen laptop sleeves from the House of Adeline. Interrupting our laptop bag coverage to bring you this important announcement about a Fujifilm Digital Camera Giveaway. Check out my marketing blog - I've written about Fujifilm's Get on the F list Program where they are giving away several cameras. Plus, I've got a link to a secret "instant win" plus my own giveaway - for a song :) Check it out. Deadline is NOON PST Dec 23!! The lovely Lisa at O Yikes! was kind enough to send me one of their sporty, colourful Slingback 9-2-5 Packages to try out a while back. It's a very compact, good-looking bag. I did have a couple of size issues with the Slingback, however, so I was unable to perform my usual "week of use" testing prior to my review. Just wanted to let you know up front - I have touched, poked, prodded and admired the bag, but have not taken it into the fray. The Slingback's laptop sleeve fits up to a 13" screen and my MacBook Pro is 15". FYI - O Yikes! *does* make a large laptop sleeve that fits up to a 15" laptop - but the large sleeve will not fit in the Slingback. The other thing the Slingback doesn't fit is me. I didn't get out the tape measure, but let us say this: if you are at the upper limit of size at Lane Bryant or are very large bosomed or barrel chested, the Slingback is not the bag for you. That all being said, there's much to recommend the Slingback. The 9-2-5 Slingback Package (the Slingback, the matching laptop sleeve and accessories pouch) is a great value and makes for a very versatile bag. Leave the laptop sleeve out and use it as a diaper bag - or leave the Slingback at the office and take the laptop sleeve to your meeting (it has its own shoulder strap!). The Slingback is made of sturdy nylon material with solid, good quality hardware (zippers, clips, etc.) I love the cheerful colours it comes in - I chose the Tangerine Raspberry colourway (my wedding colours!) but it's also available in more subdued tones if you prefer. 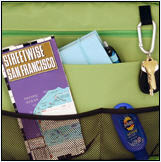 The Slingback itself is well thought out and offers plenty of organizational options. The smaller front compartment has a generous gusset and a mesh pocket to help keep things in place. 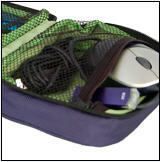 The larger main compartment has plenty of zip pockets and pouches for your valuables and other daily essentials, from USB keys to talcum powder. The Slingback's ergonomic strap fastens across your chest with Velcro and a buckle to keep it secure. 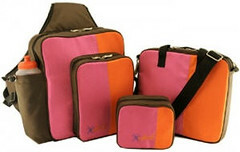 And the chest strap has a holster pouch for easy access to your cellphone, mp3 player or PDA. I also like the exterior bottle holder - excellent for your water or, when riding public transit, your flask. The laptop sleeve is as padded and sturdy as the Slingback. 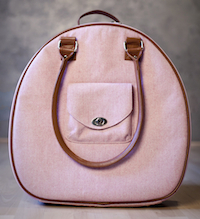 As I said, it comes with its own shoulder strap, but also has handles for easy toting. 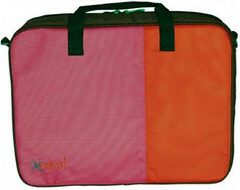 The laptop sleeve has a back pocket as well, for a notebook or similar, and it comes in the same bright colours as the Slingback. The square accessory case was my personal favourite part of the 9-2-5 Package - it's big enough for my powercord and mouse and the see-through mesh pockets let me see what's in there without having to empty the thing out every time I was rooting around for a memory card or lozenge. Would I recommend the Slingback to a smaller person with a smaller laptop? Without reservation. It's a cool, unusual shape as well as being a well-designed bag. And, in the spirit of disclosure, when I pass it on to someone who can use it, I'll be selfishly retaining the accessory case. Bigger gals with bigger 'books (or bosoms) should check out the O Yikes! 9.2.5 Messenger Package. UPDATE: The O Yikes! Slingback has been retired. I adore paper. I would keep stacks and stacks of it if I could just to look at, fondle and be inspired by. Via The Sweetie Pie Press (a very clever artist who specialises in yummy-looking buttons) I found out about this amazing holiday giveaway of Japanese chiyogami paper from The Paper Place in Toronto. Aren't these buttons delightful? Becky makes some of them using papers from The Paper Place. I put buttons like this on some of my more plain laptop bags. Will have to get a picture. Do you decorate your laptop bag with anything? These are two bags I've discovered recently that I would love to have. Either the laptop version or the smaller versions as a day-to-day satchel. The first is a vintage military-styled bag from Porter, part of their William Gibson line. The second was a find from a fellow Twitterer @samtitle (btw - I'm on Twitter as @mynameiskate) Saddleback Leather makes some amazing bags. I've fallen a little bit in love with their messenger. There are a lot of sales happening as we head into the holiday season. I'm tracking them on the 2008 Holiday Season Laptop Bag Sales page. Check it out!